Mankind has only one home - the living earth. But pollution is undermining its life-support system. Man must reorder his thinking in terms of planetary housekeeping if life is to continue its voyage on Spaceship Earth. 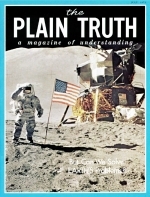 The Astronauts' voyages to the moon introduced a new global concept of man's world. We live on a spaceship named Earth. Just as the astronauts had to carefully maintain their life-bubble, humans on earth must also see that their life-support system is perpetuated and not polluted, if our marvelous spaceship is to function properly.